Select a device from the list and click the Locate Load Driver. Browse and select a driver INF file in the dialog that is displayed. 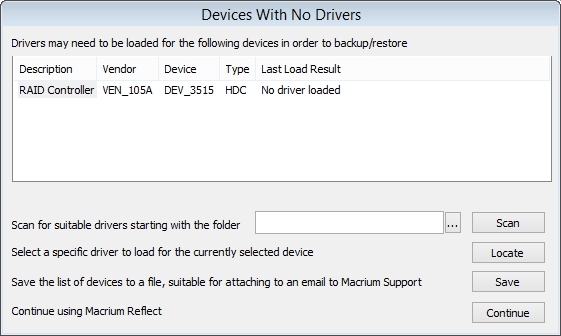 Macrium Reflect will try and load the driver and report the result back. Select a base folder using the ellipsis button and then click Scan. Macrium Reflect will traverse the folder structure looking 'Scan Folder'. The selected folder structure will be searched for driver INF files for all devices in the list. After the scan, a dialog will be displayed showing which devices had drivers loaded.